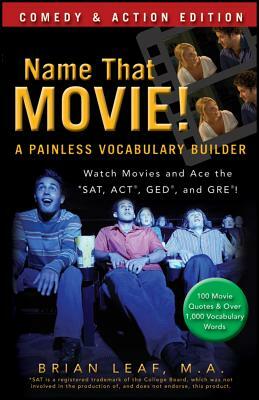 Do you need to brush up on your vocabulary skills for the SAT, ACT, GED, or GRE exam? Ever wish you could put your talent for quoting movies to more use than one-upping your friends? Now you can do both with Name That Movie! A Painless Vocabulary Builder: Comedy & Action Edition. Name That Movie! is the only vocabulary workbook that capitalizes on your insatiable appetite for comedy and action movies to help build your vocabulary for standardized tests. First, you'll be presented with a popular quote. Then you'll identify the movie and scene from which it was taken. Next, you'll jot down possible definitions for each bolded word in the quote and check your answers against the solutions provided. It's that easy! Whether you're the king of quoting Knocked Up or just want to find a more exciting way to build your vocabulary skills, Name That Movie! A Painless Vocabulary Builder: Comedy & Action Edition is for you!